The craze for food trucks is trending in India; it has shown tremendous growth of 7.9 per cent, which undoubtedly makes the food truck business a profitable restaurant business model. Now, the food trucks have to compete with other food truck owners, restaurants, quick service restaurants, and the street food vendors which makes it imperative for a food truck owner to increase the sales to keep the wheels of the truck moving. It is not enough to open a truck and offer quick bites; you will have to strategize to make a profit. These solid ten points will help you multiply your money, attract more customers, and grow your food truck business. Increasing the sales of a food truck business is not an easy task. Here are 10 excellent strategies that would surely help you improve the sales of your food truck. This is one of the most critical aspects of making profits for a food truck business. Establishing a unique selling point for your food truck is very important as it helps attract more customers, and thus increasing the word-of-mouth for your business. There are several food trucks out there, what are you doing differently? Your food truck should have an exclusive design, an apt name and something unique to offer. “South 2 Mouth” is a perfect example of how having a unique selling point helps increase the sales. This “food truck” isn’t exactly a food truck, but a goods carrier moulded to be a unique foods carrier! This quirky looking food truck in Ahmedabad is making news around town because of its looks and lips smacking South Indian food. The owner wanted to create a buzz in the city and was bored with the concept of trucks; therefore he decided to come up with this distinctive looking wagon. To increase the sales of your food truck business, you need to improve the efficiency of your staff as well. That does not mean rushing your customers. Instead, invest in a good food truck POS system. There are several benefits of having a POS to manage the daily operations – from quick billing to easy analysis. Easy billing: You can quickly generate bills on the move no matter what your location is. A POS system with Bluetooth printing will help you generate invoices rapidly that will let you serve more customers. Integrated CRM: Capture the details of your customers and segment them in various categories depending on their behaviour. This will help you send personalized emails and SMS alerts. Real-time reporting: You can analyze the real-time reports of your food truck from anywhere and track the performance of the food truck. Mobile ordering: In today’s tech-savvy world you cannot afford not to have mobile ordering enabled for your food truck. Using a POS system would give you live updates of the orders on the move. All these features make it easier for you to manage your food truck. You should have efficient staff and an optimum system that would help you handle the customers coming to your food truck more systematically. You might have created the best menu for your food truck, but it is not a smart choice to stick with the same menu season after season. Editing the menu can be a daunting task, but it is necessary to up your sales. 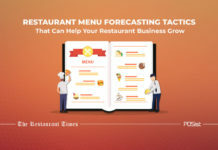 You should consider varying your menu from time to time to attract more customers. You can introduce a new seasonal dish for a particular period. For example, you can create a new food item using mangoes during the mango season. This gives some variety to your menu and helps in increasing the sales as people these days are quite experimental, and do not shy away from trying new dishes. This is a sure-fire way to keep your customers coming back in the search for something new. Additionally, ensure that your menu has been engineered well. The food truck menu should ideally be short and highlight your most popular and high-profit items. Combo meals are a great way of having your customers spend more. These combos should have an appealing price and offer a wholesome meal to your customers. Select the items and combine them to make a combo meal. It is an excellent way of combining low selling and high selling items also; it encourages people to buy more than what they came in for. Train your staff to upsell the combos and make them look appealing for your customers. Combos are a great way of increasing sales and also promoting the low selling items on the menu. Unlike a restaurant, a food truck business does not have a fixed location which increases the potential customer list for a food truck. If you feel a particular location is not doing well for you can always drive to a place where you think you can generate more income and sell more food. You can park your vehicles near business districts, bars, etc. but, you need to ensure that you are not violating any parking regulations of a particular spot. Parking matters above all; if you have the best food but a poor parking location, your sales won’t be good. Having a good and accessible location would help build an excellent reputation for your food truck. Food truck parks, which are essentially food hubs have also emerged these days where a number of food trucks, food carts, and street food vendors offer their food to customers. Such clusters witness a steady footfall as customers have multiple options to choose from. Food trucks are mostly on the move which makes it very important for you to market yours right for better visibility. It is not always about finding the right location but also about your promotion strategies that help increase the sales. There are several ways to endorse and make your food truck known in the marketplace. Market on your food truck itself – Make use of the vehicle you have, clearly, mention your restaurant’s logo and the social media handles on the truck. It is all about making your brand visible. Go local – Place your ads on the local newspaper or radio stations and spread a word about your food truck business. Stay Online – Regularly update your social media and Google My Business profile and let your customers know where they can catch your food truck next! Having an online presence would help you tap the audience who are searching for pocket-friendly options near them. Employee Branding – Make your employees wear your branded t-shirts or cap all the time during work hours. Network with local businesses – you can ask nearby shops or offices to display your food truck’s pamphlets. Attending local food festivals is an excellent way of increasing your reach. It is a great platform for the food truck owners to make their brand visible and increase the sales. You can attend popular food festivals like The Grub Fest, Delhi Food Truck Festival, etc. as they have an adequate footfall of hungry diners. It is important to note that a stall at a well-known food festival could cost you Rs. 50,000 or more for two to three days; therefore make sure you determine beforehand if booking a place at a food festival would be a high return on investment for you. Carry out some research on the food festival that attracts you and see if you would like to park your food truck there! People no longer wish to stand in long lines waiting for their food. Therefore confining your food truck to takeaway only would not help you increase the sales. Instead, opt for delivery. This is a great way to reach out to your customer who might not be in the vicinity of your food truck. You can take advantage of the third party delivery services like Swiggy, Zomato, etc. or you can hire a person to handle the in-house delivery for you. Offering delivery is also helpful if you wish to park the truck at a fixed location. This way you won’t be missing out on the customers in various places. Food delivery provides faster service, and people get the comfort of ordering the food from anywhere. You have to keep a close check on the sales metrics as this would help you forecast and better strategize for the coming days. You need to know how much was the sales for the previous month, how much inventory you are left with, what was your labour cost, etc. All these metrics help you determine your pain points and makes it easier for you to work on them and increase the sales. Metrics play an essential role in any restaurant business, and a food truck business is no different! Nothing attracts the customers more than good food and the best service. Make sure your employees are performing the best and delivering the best food to the customers. You can encourage your customers to give feedback on social media or a feedback app; these feedbacks help you improve your services and cater to your customers in a better manner. If your service is quick and top notch you are sure to attract more customers and increase the sales of the food truck. A part of owning a food truck requires you to learn how to sell your products and services. For a food truck business, increasing the sales can be a little troublesome due to the limited resources but these ten points will help you improve the sales and also keep the wheels of the food truck moving for long! It is a very comprehensive and well-detailed article, it comprises of everything that a food truck owner or an aspiring food truck owner should be aware of. I especially liked the content under, pay attention to the metrics. Importance of marketing a food truck business is very important. Social media needs to be part of your food truck marketing plan especially if you don’t have a lot of money to invest in other marketing tools. Even if you aren’t open yet, go ahead and set up business pages for your food truck on Facebook, Yelp, and Twitter.